TIME to leave the birds again, for a little while at least so they can get on with their lives, but before I do, I would like to clear up a few points following the last chapter where I told the story about Chubby being so patient as she waited her turn to be fed, while Squeaky ‘squeaked’ impatiently, which was a bit unfair on Squeaky. I have found over time that all the butcherbirds, male and female, are very patient and seem to know when it is their turn for a piece of hamburger. Squeaky squeaks to get my attention when he and Chubby first arrive – and then throughout the feeding he will continue to voice his presence, but he still politely waits his turn. The only difference between him and Chubby is that she eats quietly and is trusting enough to come closer to the trough so to speak than Squeaky. All Squeaky’s crew are patient too and only occasionally will one of them intercept a missile aimed at another bird but on the whole they are quite considerate of their offsiders. Another point I didn’t elaborate on is as I have found out, all the singers amongst Squeaky’s crew seem to be male, which probably explains Squeaky’s vocalizations. The females don’t seem to have the need to tell everyone that they are there – Oops! Here we go again. The males sing a beautiful sweet song that is a pleasure to hear as it lilts across the neighbourhood breeze. It must be a male thing for remember Donald, Mum and Dad’s chick? He just loved to sing and yet his sister Daisy was never heard to make a peep – or should that be cheep? Chubby is not mute, for although she doesn’t squeak like her partner, she does quietly squeak thankyou every time she flies off after she has had enough, usually taking the last piece of hamburger back to her tree house with her. I am positive that that’s what she is doing and it warms my heart to hear it. She has also been inside my unit. 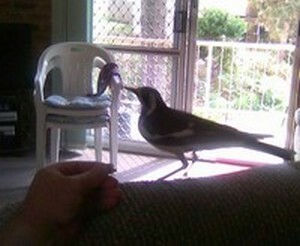 Brucette is in the habit of coming in all the time and will perch up on top of my lounge chair to be hand fed a snack. (as she is doing, pictured left) I sometimes keep some hamburger close to the computer and leave my screen door open for that purpose. Chubby also wanders inside occasionally although usually she stays on the carpet near the doorway, but one time when I had left the door open for Brucette and I was engrossed in my blog writing, I suddenly felt I was being watched. I looked up and there was Chubby, happily perched on my cooling fan, not an arms length from my left shoulder and right next to the computer, quietly watching me as I worked. I couldn’t believe it. I slowly reached for the hamburger meat I had set aside for Brucette but Chubby flew back to where she was used to being fed at the doorway, but it was lovely to realize that she was trusting enough to come so far into my abode and then patiently wait until I was ready. Posted on September 22, 2011, in Natures Pecking Order and tagged Mother Nature, Wild Things. Bookmark the permalink. 2 Comments. 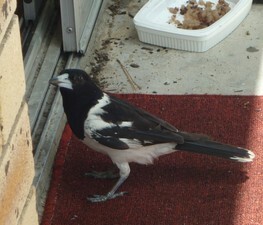 I’ve never seen a butcherbird before. Thanks for sharing.